Please forgive me if I have been mentioning hot summer too much, Spanish summer is so irresistible to me. It is not only because I always like hot, sunny summer weather, but also this hot air in the day and nice gentle summer evenings all remind me the summers I had when I was at home in China. Having been eating in the restaurants many days, what I really crave is … Chinese cold noodles , :) like the ones I used to have at home, my mum made them… have tried to ask in many Chinese restaurants here if they serve them — no, they don’t, but not much to complain about, because this is a quite typical Northern Chinese dish (I think), and a very home-made dish. 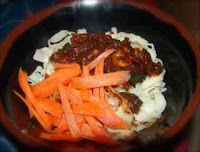 It is actually a very simple dish – soybean paste mixed noodles. Although you can use packed soybean paste directly, the paste normally needs to be re-made. For example, you can stir fry it with different ingredients depending on your taste, then mix it with boiled and then rinsed cool noodles. So it is called zha jia mian , as in fried paste noodles . This time I made home made noodles , similar to the Da lu Mian dish I made before. :)) Otherwise, you can use those ready-to-boil noodles sold in the shops as well. Another thing to do is to make the soybean paste sauce. As I mentioned in a previous post, there are a few different types of soybean paste. The one commonly used for this dish is called Da jiang — just the plain soybean paste, no actual soy beans or chillis in the paste, it is very salty, but has a very strong soybean taste. The reason for re-making the soybean paste is to make its taste richer. 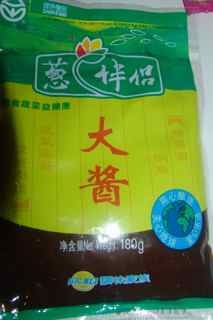 Soybean paste can sometimes be re-boiled with seasonings for hours, or it can be stir-fried with vegetables, eggs or meat mince. And similarly to Da lu mian, you can also make some shredded cucumbers or carrots to go with the noodles. In this recipe, I used eggs, green peppers and dried shrimps (which can be replaced with fresh shrimps). If the re-made soybean paste is salty enough, it can be kept well in the fridge for quite a few days. 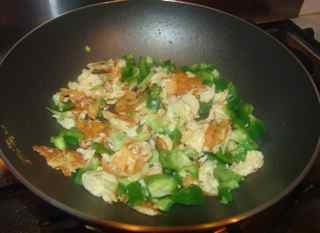 oil, egg, green pepper (optional), soybean paste, dried shrimps (optional), spring onion, soy sauce, cooking wine, sugar and sesame oil . 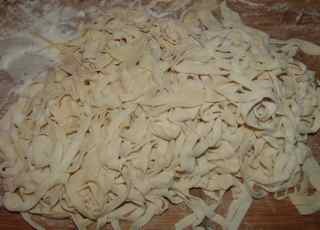 You can either use one egg or prepare the noodles without eggs, in which case you just need flour, water and a bit salt. In my previous post, I described in detail how to make the noodles by hand . 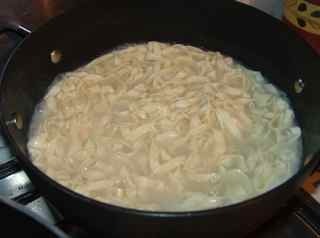 Once you have made (or bought and unpacked) the noodles, simply boil them and then rinse them in in cold water. 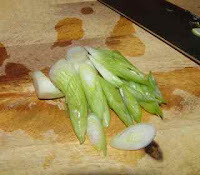 1）Chop around 1 whole spring onion and 1 green pepper to small pieces. 2） Beat 2 eggs in a bowl. 1） In a heated wok, pour in around 3 tablespoons of oil, when the oil is hot, put in chopped spring onions, and add 1 tablespoon cooking wine. 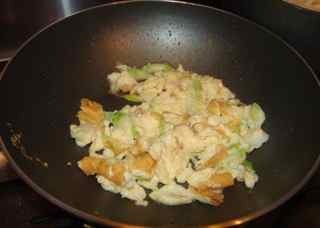 2）When you can smell the spring onion, add in whisked eggs and keep on stirring, the eggs are then becoming small pieces. 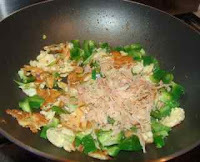 3）When the eggs are forming up, put the chopped green peppers and a handful dried shrimps, stir everything well. 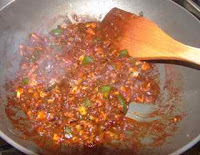 4）Then add the soybean paste in (I added the whole package, the leftovers can be used for later anyway. You can add less though), then add 2 tablespoon light soy sauce, 1/2 tablespoon of white sugar, stir everything well, if it is too dry, add a bit water. 5）When everything is well mixed, turn off the fire, add in around 2 tablespoons of sesame oil before remove everything to a bowl. 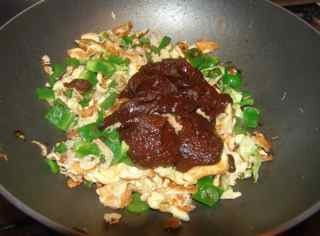 In a big bowl, put rinsed noodles first, then add 1 or 2 tablespoons of ‘re-made’ soybean paste on the noodles. If you like, you can also add some shredded cucumber or carrots in, or chilli oil. Mix everything well in the bowl before eat. It is good and fresh for a hot summer dinner. If you use ‘ready-to-boil’ noodles, it is just a quick fix dish. 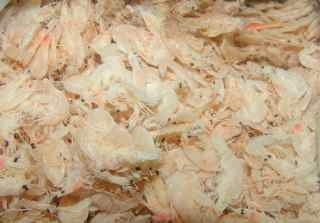 It can be eaten on its own, or with some small salad (liang cai dish) or stir fried.